The time had come–the time to take charge of my weight, my health and my life. This was five years ago, October 2011, and I weighed about ten pounds less than I had a year earlier. Ten pounds is progress, but the goal was 40 and something new was clearly called for. I needed to recommit, to be persistent in achieving my goal. I believe in persistence, but it was clear that I also needed to be consistent. I’m not an expert in health, diet, or exercise, but I do know a false choice when I see one and I was looking right at one. The false choice: Do you want to lose weight or be fit? Losing weight meant improving my diet. This would be simple because my diet was horrible. Improving fitness was equally simple because I was a die-hard Sofa Spud. Simple yes, easy not. I knew that the only reasonable choice was both. It was time for a plan. When it comes to weight control, there are four levels of support. When it comes to weight loss, there are four levels of support. As you work your way down the list, they bring in more expertise, more people, more resources and more expense. The key is to go down the list as far as you need and no more. I started by trying to figure out what I could by myself. There are lots of books on the subject of weight loss, each offering its own spin. Each of them worked for someone, but each disagreed with the others. Failure rates were abysmal — my personal failure rate 100%. I decided to take the extreme common sense approach I use for almost everything: first, get out of my own way — stop doing the stupid, goal destructive things guaranteed to produce failure. Item 2 on my list, eliminate unhealthy snacks, is an implementation of the idea to stop doing stupid things. I balanced it with item 3, selecting smaller portions and better choices. Even in fast food restaurants, the choices you make can add up to hundreds of calories. I adopted a quote from Tony Robbins as a reminder. I chose walking as my exercise of choice. I have never been an athlete and I enjoy walking. A friend inspired me with his own walking program, which included listening to audio books. My version of it included and eventually evolved into self-growth programs and podcasts. Another key element of the plan was consistent measurement. I selected an app to measure walking distance, record the calories I ate, and track my weight. I directly addressed both sides of the false choice: weight and fitness. The difference this time, not expressed in the plan, was to shift my lifestyle. The plan was to introduce walking as a daily habit to continue indefinitely and to permanently cut out the calorie-rich snacks and foods that had dominated my meals. So what happened? On the small scale, I missed my target. On the large scale, I achieved my goal. 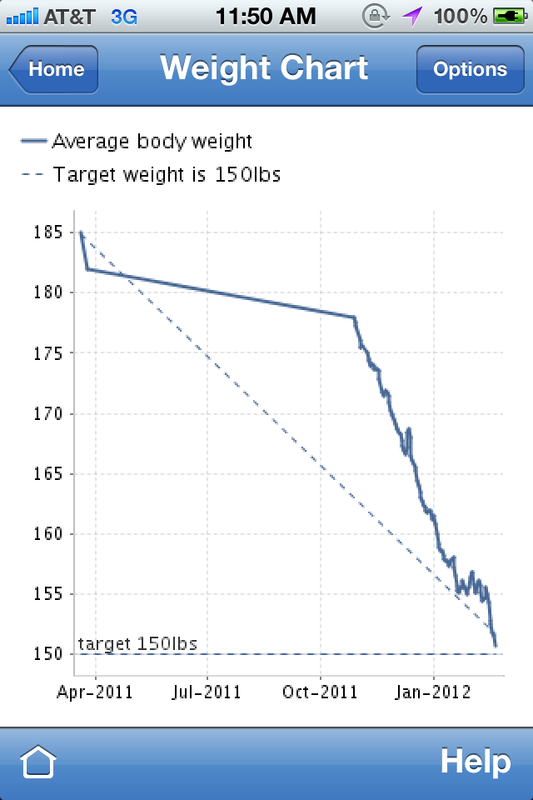 You can see from the graph that I missed my target by either a few pounds or a few weeks–missing my goal on the small scale. On the larger scale, I brought my weight, my exercise and my eating under control and five years later I still do. The Buddah was right. The stream always wins.